The mango diet should come with an offer to purchase swampland in Florida. For starters, the connection between fibers from fruits and fat control is age-old. Many fruits contain fibers that help to reduce cholesterol. Apples, oranges, figs, dates, pears, nectarines, and a host of fruits contain beneficial fibers that help to control fats in the blood. So this purported benefit of the “amazing” African mango is nothing new. Soluble fibers in general (like the well-studied beta glucans in oatmeal) help to keep cholesterol in check. This is a basic aspect of how many types of fibers work in the body. Other fibers such as glucomannan and galactomannan demonstrate fat-controlling properties. But none of these foods works as a weight loss plan without calorie control, eating certain foods and avoiding others, and regular daily exercise. Yet according to hawkers of the mango diet, small capsules of African mango seed extract contain the power to deliver rapid weight loss and a sleeker, more svelte you in just weeks! Just think how you’ll look in your bathing suit after a bottle of these over-priced, ineffective capsules. The truth is, you’ll look no different at all, but you will feel sobered by your experience as a consumer. The promoters cite a study conducted in Cameroon in which subjects who took 150 milligram capsules of African mango seed fiber extract twice daily supposedly lost weight and improved several other parameters of health. Before you start swallowing either these results or some of the capsules, wait for a few large studies showing similar results. We have seen a great many such studies with similar results, for products that just don’t work. What lies at the foundation of all diet scam successes is the yearning to lose extra weight. As obesity rates soar and scales tremble under the heft of our plus-sized society, there is ample opportunity for companies to make fast profits on diet schemes that simply do not work. And unfortunately, the two governmental agencies most responsible for protecting the public from unsubstantiated health claims, the FDA and the FTC, are under-staffed, and seem to lack the motivation to pursue the profiteers who make these claims. Any little shard of suggestion that something might help with weight loss is sufficient enough to launch a highly profitable business—for a time. What all these diets have in common is that they all fall apart once many people have tried them and become disappointed. 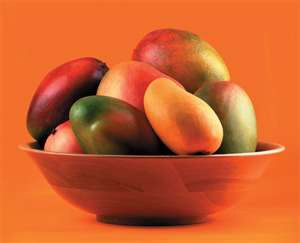 Mango fruit, rich in fiber and loaded with the antioxidant carotenoid group, is one of life’s eating pleasures. Many is the person who, upon eating fresh mango for the first time, is overcome with pleasure by this remarkable work of nature. Eat mangoes in season, and know the pleasures of this extraordinary fruit. Capsules of African mango seed extract, however, have a long way to go before they can serve the legitimate needs of an ever-obese public. If you wish to lose weight, the basics apply. Eat smaller portions. Eat cleaner foods, like fresh fruits and vegetables, eat fewer refined carbohydrates (white flour, sugar, corn syrup) and stay away from fried foods. Walk a few miles every day. Take your weight reduction seriously. You didn’t get heavy in a week and you will not lose a lot of weight quickly. Develop healthy lifestyle habits, rather than running from one miserable diet craze to another. Real weight loss can be accomplished, if you are willing to make these changes. As far as the “mango diet” goes? Leave it to those who don’t mind being disappointed again and again.